Its been about 2 & a half months since I have updated my hair routine. I used to not really care what types of products I used in my hair as long as it looked shiny even if it didn't feel so healthy. For years I have been colouring my hair from dark to light & back again as well as using many Heat tools (I pretty much used to straighten my hair everyday) . Recently I noticed my hair has been getting pretty bad with breakage, split ends & being extremely dry on the ends & oily at the roots. I would wash my hair every day as I hated the way it felt every morning which probably contributed to even more damage. I had been researching different brands for good quality hair products that could help me with my concerns. I was really interested in Hair Oils and was tossing up between Argan Oil & Macadamia Oil. The main reason I chose Macadamia Natural Oil over Moroccan Argan Oil is because the Macadamia Oil products consist of a mix of both Argan & Macadamia Oil. It all started with this Healing Oil Spray my sister brought home. The hair dresser recommended it to her (I'm not sure how much she paid for it) and she said we could share it as she wasn't liking it to much. I on the other hand fell in love with it. The bottle says "Macadamia Healing Oil Spray is an ultra fine mist that instantly absorbs into hair, weightlessly infusing moisture, health, softness, protection, control & shine. A lighter solution ideal for fine hair yet excellent for all hair types"
I use this in my hair as a heat protectant when I want to blow dry/straighten my hair (which is about twice a week). You don't need to use much of this product for it to work which is great because this bottle will last you ages. I just spray this once onto my hands and run it through my damp hair & then blow dry it. This always leaves my hair feeling so soft & smooth & gives it a nice natural shine. since I have been using this product I have been getting so many compliments on my hair and how healthy it looks (& feels). This product I find doesn't weigh my hair down & it has a nice smell to it that isn't to ver powering like some oil smells can be. I have been using this products for about 6 months now and the bottle just never seems to run out which is great because this really is great value for money. I also love the packaging for the Macadamia Natural Oil products they all come in either brown glass bottles or brown plastic containers that have this really cool floral scribble type pattern running through it & the labels are all bright green which just stands out so much against the brown & adds a lovely colour to it. The pack costs $52.46 from BeautyBay.com and contains 100ml of the Rejuvenating Shampoo, 60ml of the Moisturizing Rinse Conditioner, 100ml of the Deep Repair Masque, 30ml of the Healing Oil Treatment, 60ml of the Nourishing Leave-in Cream, an Oil Infused Comb & a Travel Bag to put all the products in. This travel kit is a great way of trying all these products if anyone is interested in the range but not sure what products they need/like. The Shampoo lasted me about 5 washes & the conditioner about 3. I don't understand why the Shampoo size was larger than the Conditioner as I find that I use more Conditioner than I use Shampoo. The sizes however were big enough to see how I liked the product. I have purchased the full size (300ml) of these bottles and currently use them in my hair care routine. I love that both of these products are Colour Safe, Sulfate Free & Paraben Free. They both smell amazing and very refreshing. The Shampoo has great lather and leaves my scalp feeling clean without feeling like its been stripped. The Conditioner I find tends to run out much faster than the Shampoo. I have to use a lot more than I normally would & it isnt the most moisturizing Conditioner I've used (and I like my Conditioners to be moisturizing). I really wanted to like this Conditioner but I just don't think it is the best match for my hair. I will continue to repurchase the Shampoo but I don't I would repurchase the Conditioner. 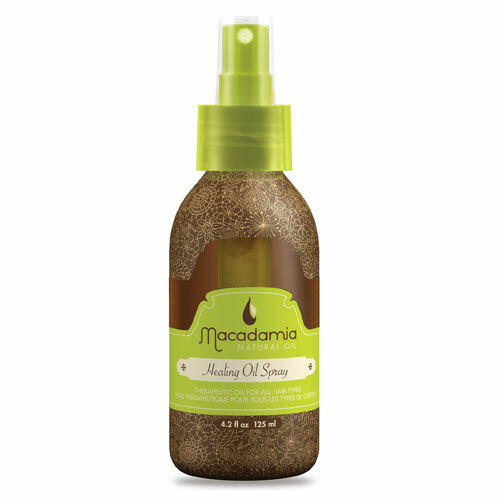 Have you tried anything from the Macadamia Natural Oil line? I tried the mask once and it smelt really nice! My hair seems to be quite similar to how yours was: dry, brittle on the ends, but then the roots can get quite oily. I have to wash my hair each morning, because otherwise it feels horrid. I am definitely going to try these out! I've heard sooo many great things about this product.